Don Jason, MLIS, MS serves as the Clinical Informationist for the University of Cincinnati (UC) Health Sciences Library. In this position, Mr. Jason utilizes his strong background in informatics to deliver services and resources to the UC Academic Health Center. Mr. Jason’s unique role, allows him to develop resources and services that focus on informatics, patient care and clinical research. Immediately preceding his appointment at UC, Mr. Jason completed the National Library of Medicine’s Associate Fellowship Program. This early career success was made possible by a strong academic foundation. Mr. Jason earned two graduate degrees from Kent State University. These degrees include a MLIS and an MS in Information Architecture Knowledge Management, with a focus in Health Informatics. Mr. Jason, also holds a BS in Journalism from the E.W. Scripps School of Journalism at Ohio University. 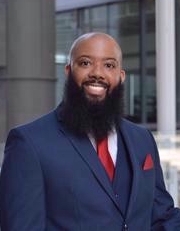 During his academic career, Mr. Jason successfully completed two Association of Research Libraries diversity programs: the Career Enhancement Program and the Initiative to Recruit a Diverse Workforce. He is also a proud recipient of an American Library Association Spectrum Scholarship.